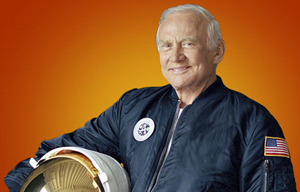 Following his raptastic hook-up with Snoop Dogg, multi-talented Moon geezer Buzz Aldrin will be strutting his stuff in the forthcoming series of Dancing With The Stars - alongside cream-splattered beach strumpet Pamela Anderson. Season 10 of ABC's terpsichorean spectacular will also feature the celebrity pins of reality TV stars Kate Gosselin and Jake Pavelka, singer Nicole Scherzinger, Olympic gold medal figure skater Evan Lysacek, sports broadcaster Erin Andrews, football star Chad Ochocinco and actors Shannen Doherty, Niecy Nash and Aiden Turner. According to the BBC, executive producer Conrad Green enthused: "It's definitely one of our strongest cast line-ups ever. Pound for pound, it should be really fascinating watching." Indeed, it's not many networks which can pack a dancefloor with such galactic talent, including Mr Aldrin (world famous space star), Ms Andrews (world famous hotel room peephole vid star*) and Ms Anderson (world famous amateur grumble flick star). *If you're unaware of the Erin Andrews peephole outrage, you've no business bothering us here down in Bootnotes. Get thee hence to your favoured search engine, and don't come back until you're fully up to speed. More like National Fail amirite?